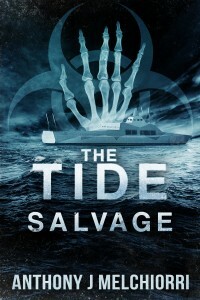 Book 3 in The Tide series. New heroes emerge from the smoldering ashes of humanity… But so do new threats. A man-made plague has ravaged humanity, the military is in shambles, and chaos reigns over the world. Hope seems nothing more than a dream. Captain Dominic Holland is determined to stop the inevitable. His daughters are finally safe, and his crew has found new ways to combat the Skulls. He leads the Hunters on a mission to recover vital research that may hold the key to stopping the biological agent responsible for this apocalyptic new world. But unexpected new dangers threaten the Hunters’ efforts. They must adapt and face these challenges with everything they have. After all, it’s no longer just their lives on the line. The future of the human race relies on their success. Can the Hunters salvage what remains of humanity? Or is it already too late?